So, while I'm a teetotaler, that doesn't mean that I don't enjoy the ambiance of a good beer garden, or Biergarten, if you will. I actually like polka music, thankyouverymuch. And, I dunno, maybe I'd wear a pair of lederhosen. It's shorts and suspenders all in one! Anyway, all that aside, Steamboat Gothic Studio has relaunched Biergarten, their tile-laying game, on Kickstarter. 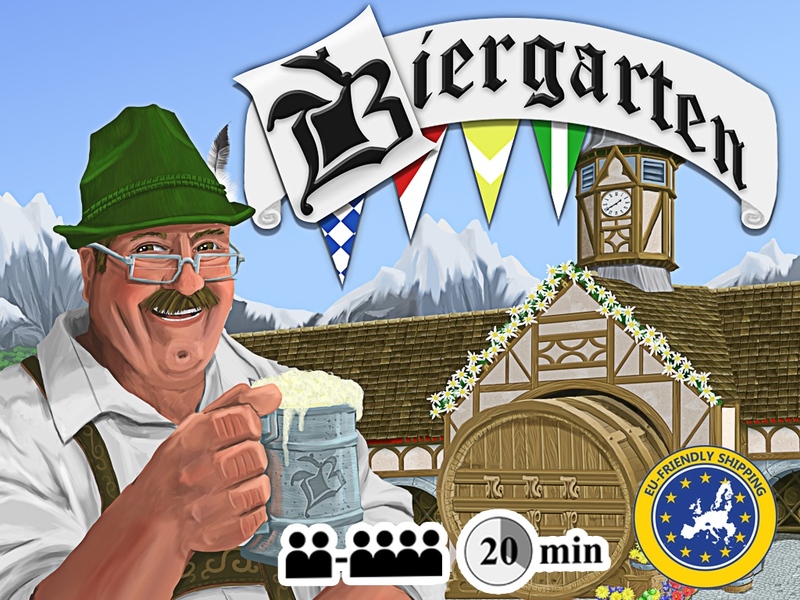 In the game, players are trying to create the perfect biergarten. You do this by laying tiles next to one-another, starting with a "home" card. Players earn points for matching colors between the cards, as well as other bonuses for creating lines of like-colored umbrellas and for fully encasing their biergarten in a wall. What seems like simple choices quickly become complex as your biergarten grows and you draw new tiles. Who will have the one biergarten to rule them all? Hopefully you're not too drunk at the end to find out. The campaign just started back up today and is set to run for another 28 days.